Bierley Vision Club - Now libraries can be members too. Surveys have found that especially with elderly people, reading can be beneficial to health and well being, and we believe libraries are a good place to start. In essence, the concept behind the club is to allow anyone immediate access to top quality, electronic magnifiers. Members can borrow a magnifier and try it for a few days to see how they get on with it or keep it for years with total peace of mind. We realize that some libraries are on a very tight budget or have even spent money on magnification equipment that doesn't get used. BVC to the rescue. A library can become an individual member. This means you, as a library, can borrow any of our magnifiers from just $14.95 for one magnifier or $24.95 for two. Try a Maggie and a ColorMouse-USB for a month to see how well your patrons like them. Continue for as long as you like, but if at anytime you feel that the less than 50 cents per day isn't well invested, simply return the magnifiers to us. It's that simple. Electronic magnifiers for anyone with vision loss. Bierley have been helping people with vision loss, Macular Degeneration, Glaucoma and RP for more than a decade. It was in 2004 that the MonoMouse was introduced and since then tens of thousands of VIPs (visually impaired people), some of whom are more than 100 years old, have been able to regain their independence and enjoy reading books again. In the past, many libraries took the opportunity to assist their patrons via the MonoMouse Loan Program. We heard many stories of elderly people starting to use their library again. This makes a lot of sense because those people typically are retired and used to love reading when they were younger. 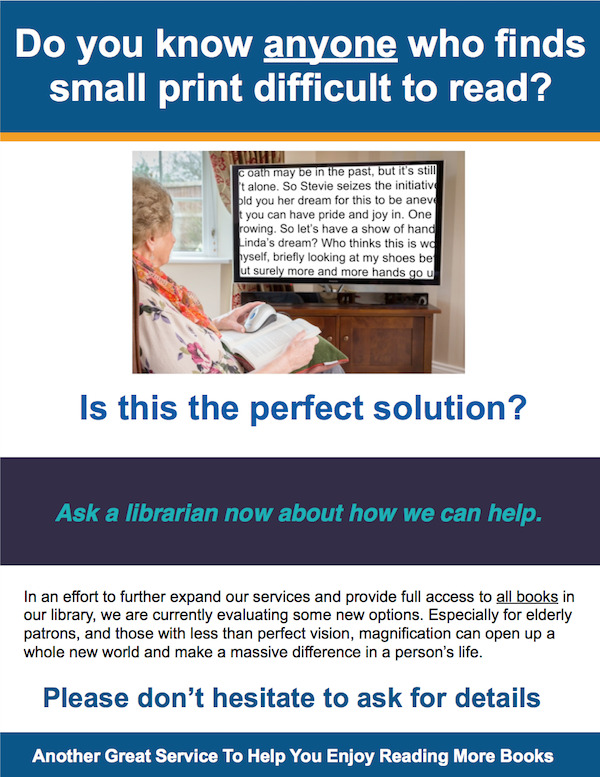 And now the Bierley Vision Club makes magnification even easier by allowing all libraries to access affordable magnifiers for their patrons. For libraries, joining is extremely easy. Just give us a call or sign up online. The magnifier(s) will arrive in a few days and you can immediately start to let patrons borrow them to access all of the reading material that you have available. You are most welcome to download and use any of the following images or documents expressly for the purpose of assisting your community to read with the BVC. This poster can be used by any library. Simply download the file, print it, and place it on your Public Notice Board. Alternatively, contact us and we will be happy to send you a complimentary laminated copy to place on your notice board.